atmospheric pictures that often relate to real or fictitious places all over the world. The attraction of the songs lies in their sense of yearning, a musical world that could be described as expansive and always provides the screen for its own projections. 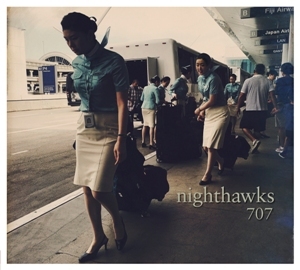 In this sense, the Nighthawks’ music is a road movie, one that has now extended to their magnificent seventh studio album. Entitled 707, the new album kicks off in a terrestrial location. For music heads Dal Martino and Reiner Winterschladen, the Boeing 707 is a pertinent childhood memory. movements – a journey lasting just under an hour. before Little Do I Know swiftly lifts the pace. Suite, created in 1998, extracts of which still appear in the Nighthawks’ live programme. There was a time when the Nighthawks did not approach live playing lightly. familiar to any serious Nighthawks fan. listener controls their own film playback.